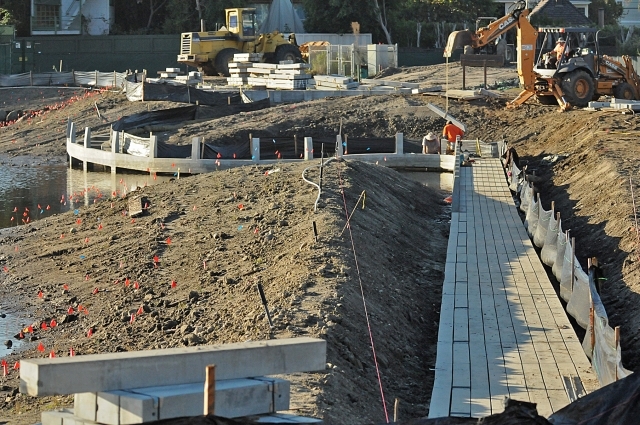 This slideshow contains 30 photos, covers period 5/19/12 – 5/03/13, and shows the ramp under construction, with additional views of the immediate vicinity before, during and after construction. 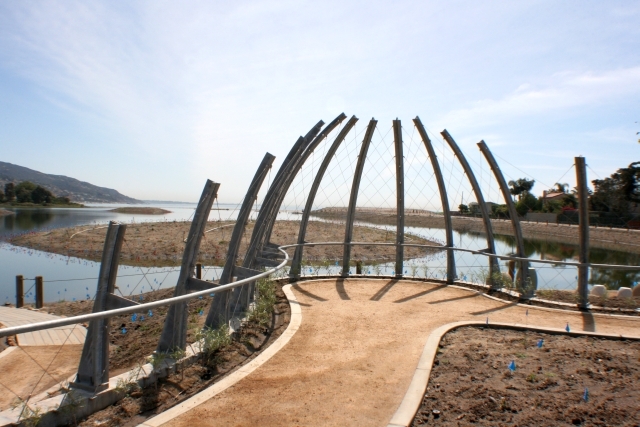 At the kelp-cutting ceremony at Malibu Lagoon on May 3, 2013, the final speech was given by Clark Stevens. I (Chuck Almdale) liked it a lot, especially the description of the Winter Ramp/Summer Clock, about which I had received many questions from SMBAS members and others, and which I have been unable to properly answer. Mr. Stevens was kind enough to send us a copy of his speech. Clark Stevens is an architect, president of the New West Land Company, Professor of Practice at Woodbury University, School of Architecture, and spoke in his capacity as Executive Officer of the Resource Conservation District of the Santa Monica Mountains. The Resource Conservation District of the Santa Monica Mountains and I are privileged to be a part of reversing the trend that has led to the loss of 90% of our tidal wetlands on the California coast over the last century. 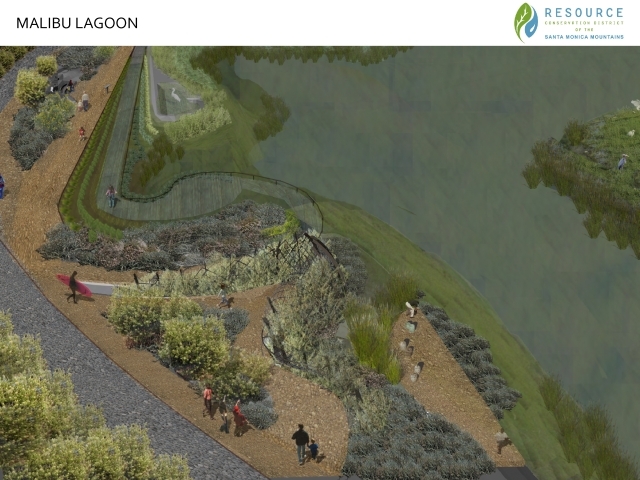 We are honored to have played a role in moving the needle back in the other direction, increasing the habitat available to those specialist species of flora and fauna that need the specific conditions that this lagoon once again provides. This restoration removed several feet of dumped fill that had smothered the entire western estuary and evicted those species which can only exist within this particular form of tidal wetland. I am so excited to know that my family and yours will get to see them return, and will know that they have returned because we have returned to them their proper home. We are grateful to the all of the project stewards, in particular the California Coastal Conservancy for their imagination and creativity in providing for a unique visitor experience that creates not only protected habitat areas, but also develops areas of more intimate visitor interaction—a unique learning landscape that we hope will inspire many new conservationists over the decades to come. 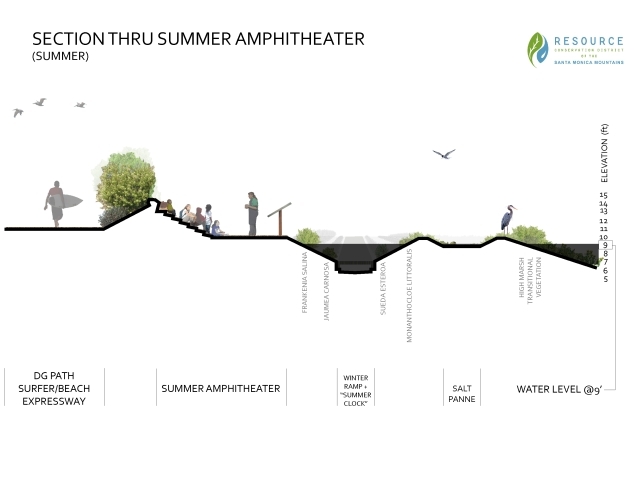 We have created places here where visitors will be able to hide in a sandbar willow thicket, or stand on top of a high tide, literally to walk on water for a few days each wet season. We have made the cycles of this uniquely seasonal tidal system more visible here, celebrating the intricacies of this magical ecosystem. One feature has generated a number of questions: The winter ramp, or summer clock- they are one and the same, but change functions and names each spring and fall. When the lagoon is open to the tides, the winter ramp will take you down into the heart of the tidal range. 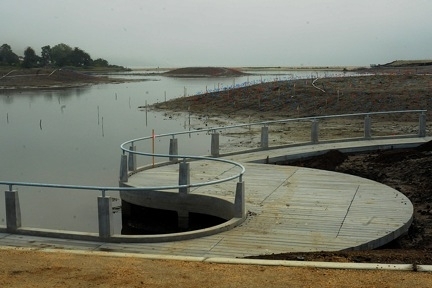 But in the spring- like now- after the building sands succeed in blocking the dwindling flows of Malibu creek from reaching the high tides, this same path will become the summer clock, marking the passage of time as the waters advance four feet up the shallow ramp for every inch that the lagoon rises. And if you are fortunate or observant enough to be here when the first big winter rain is delivered from the mountains to the lagoon, you will see the water race up the last of its path, at which time summer will end and winter will begin, as the heavy lagoon and rain-filled currents will break the sands again and our creek will rejoin the tides for another winter. So now, thank you. Thank you to this community of stewards whose vision, patience, and tenacity made this restoration possible. 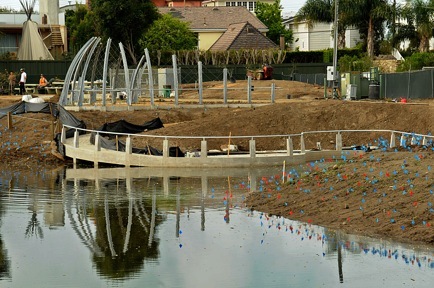 it is my great pleasure to welcome you all to the restoration of the Malibu Lagoon. In a followup email to me, Clark added far more detail. They gave me a fuller appreciation of this unique structure, and I pass them along to you. Clark Stevens: Note that the construction of the winter ramp/summer clock looks like a path on grade, but what actually appear to be pavers are in fact 6’long x 6”wide x 6”deep precast concrete joists with an acid etched finish for traction and appearance. The concrete is 10,000 psi with specially coated rebar for marine conditions. These joists have ¼” gaps between them, and span between short bridge beams, under which there is a space of 6” to a foot or more so that water can drain through the joists and fine sediments can be flushed out. The space below means that there is room for sediment to accumulate and if and when it gets to a high enough level, the joists are removable for maintenance. Although the winter ramp/summer clock is obviously not a pure wetland feature, it has become a favorite inlet for small fish and fry, including a goby which our biologists sighted yesterday[5/3/13]. The steep sides of the ramp are intended to give a visitor [the feeling] of descending deep into the wetland, so that the actual drop of only 3.5 feet (from 10 feet ASL to 6.5 feet ASL) in elevation feels like more than that. These slopes are planted with a regular banding (3 per side) of individual wetland plant species, according to their generally preferred slope conditions- salt lovers lowest, less saline-loving up high. The lower plants will have longer contact time with the brackish lagoon as it fills each summer in the closed, non-tidal condition. This abstract banding will make it easy for students to see the individual plants up close rather than trying to identify them in the natural mix of the wetland, so is a teaching aide, rather like an arboretum. Nearby is an interpretive sign that identifies the wetland plants of the lagoon as well. 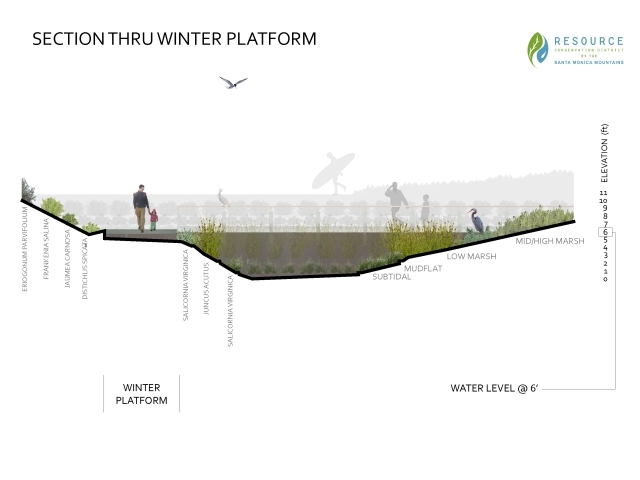 Note that the “winter platform”, the viewing platform at the lowest point of the ramp system, is at 6.5 feet ASL. This was carefully chosen so that only a very few of the winter (open tidal condition) tides will reach that level, and only about 4 per year (king tides) would allow you to have wet feet. Therefore, the banded “arboretum” plants are only wet for periods during the dry season. All plants below this level (low-, mid-, and mid-high) marsh will have tidal inundation and more salt contact during the wet season of tidal exchange. These are of course arranged in the planting scheme according to species appropriateness, but in a more naturalistic pattern. The seasonally tidal ecosystem is a game of inches and we are trying to make that evident in our ramp/clock/platform. In fact, the true nature of this restoration was to take the steep sides of the existing channels and make them a much shallower slope. So the lowest levels of the restored lagoon channel is not much lower at its deepest point, it stays lower over the entire lagoon area creating a full tidal wetland, whereas before we did not so much have a wetland as an upland with some narrow wetland channels trisecting it. I describe it by holding my hands palms together, then creating a slight “V” by separating the thumb side (top) of my hands keeping my little fingers together. This form represents the previous condition of the western upland/channel area. In that pre-restoration condition, only the one or two lowest of my five fingers are of the rare, tidal contact zone, the rest being transitional and mostly upland habitat. In the original lagoon, most of this area was above 10’ ASL. Now, spread the “V” of your hand so that you palms begin to face up and are nearly horizontal. This is the new condition of the lagoon. Now instead of one or two fingers of tidal influenced wetland, we get all four plus the thumb in the zone. For this reason I disagree that we created 2 acres of wetland and restored 13. I think that from a functional perspective we actually created 15 new acres that were not there before. And given that tidal exchange, deposition and water quality characteristics will be enhanced throughout the main channel as well, we restored 32 acres at some level, without touching 2/3rds of it. Don’t get me started on how that might help the bay as well…. Although you didn’t ask about it, the “bird blind” is really as much of a framing device for teaching as it is a place to hide from the birds, most of which are rather comfortable and are not too bothered by visible humans with those funny binocular eyes. Our intent is to weave the growing sandbar willow into a specific topiary shape, with openings low and high, vertical and horizontal, depending on the area or view condition being framed (eg. High marsh/upland transition, mudflat/low marsh, mid-high transition, etc). 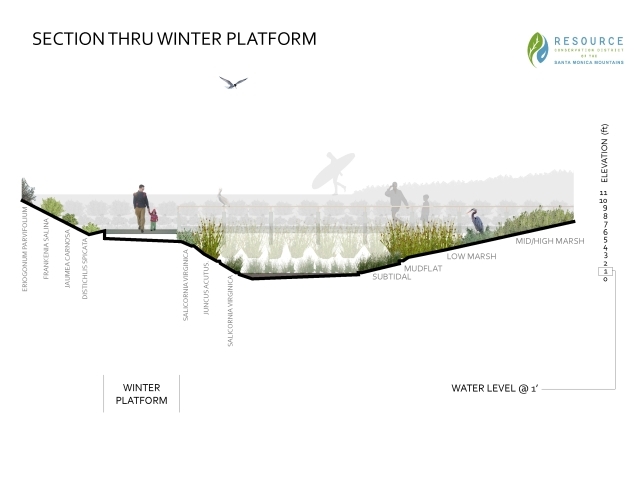 It may be evident that a decision was made here to balance the “pure” ecosystem restoration, which emphasizes wetland/habitat function over all else, with a few areas of “hands-(and feet)-on” hybrid, abstracted wetlands. If we weren’t in a place that saw hundreds of thousands of visitors each year, and which is as much a teaching/learning landscape, we would not have done the same things in our interpretive designs and public features. Malibu lagoon is truly exceptional in this and many other ways.